In the vastness of the universe, are we all just lonely souls under the same night sky? It's a big question, potentially the biggest question of all. This delightful play explores the life of Mark Williams, an astronomer at New York City’s Planetarium and a man who doesn't believe in fate... but whose life is changed forever by it. Welcome to The Starry Messenger. 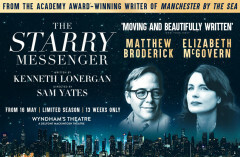 This is a superb bittersweet comedy-drama, in which the Hollywood star and multiple Tony Award-winning Broadway legend Matthew Broderick shines bold and bright as the main character. And this is his West End debut, believe it or not. You'd think he'd been born on the London stage. Mark Williams is a man who's lost. As a scientist he feels much more comfortable with the distant, chilly stars than he does to the job he's supposed to be doing, and even his wife Anne fades into relative insignificance compared to the heavens. As you can imagine Mark has no time for fate, faith or divine intervention. But the universe thinks differently, and he's helpless in the face of its power. When he meets Angela, a young single mother, he thinks maybe the stars have actually aligned for the first time. But then things go catastrophically wrong, badly pear-shaped, and he finds he has to re-evaluate his life, the universe and everything. Elizabeth McGovern from Downton Abbey and The Handmaid’s Tale stars alongside Broderick in a brave, bold dissection of what love means, what hope means, and what it means to come to a personal understanding about our place in a vast, empty universe. Kenneth Lonergan is the Academy Award-winning writer of Manchester By The Sea and one of the best-respected writers of our times. He's responsible for the magical Gangs of New York, which he co-wrote, and for writing and directing You Can Count On Me, Margaret. He has won numerous well-deserved awards and his work has delighted and entertained many thousands, if not millions of us over the years. Matthew Broderick played David Lightman in the Cold War thriller WarGames and Leo Bloom in the Broadway production of The Producers. He played a brilliant John Brown in Inspector Gadget and he's the winner of plenty of coveted awards including two Tony Awards, one for Best Featured Actor in a Play for Brighton Beach Memoirs and another for Best Actor in a Musical in How to Succeed in Business Without Really Trying. He remains the youngest ever winner of a Tony for Best Featured Actor in a Play. The subject matter means children will probably not enjoy the play much. It's written for adults. 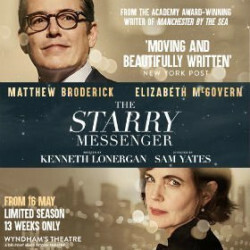 Matthew Broderick is to star opposite Elizabeth McGovern in Academy Award-winner Kenneth Lonergan's The Starry Messenger. 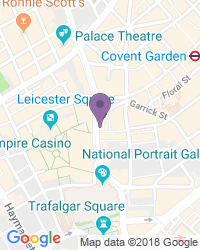 Use the search box at the top left of this page to search for The Starry Messenger tickets availability.